ah, pinterest. 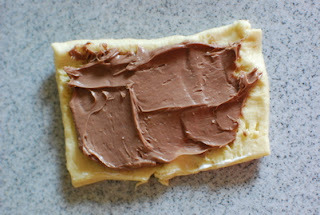 without you, where would i find all these fantastic ideas for delicious treats like homemade nutella pop tarts?? i woke up one morning with an intense desire to make these for breakfast. only god knows what the hell i must've been dreaming about. 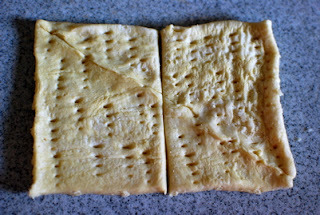 the only problem was that instead of the pie crust dough the instructions called for, my fridge contained a package of crescent roll dough. but i was determined. and i figured, how much of a difference could there really be? well, as it turned out...quite a bit. heh. it started out looking just fine. i unrolled the dough and pinched my way along the cuts where you would normally separate it into triangles. then i decided to take a fork and poke holes all over, in the hopes of deflating the dough a bit. 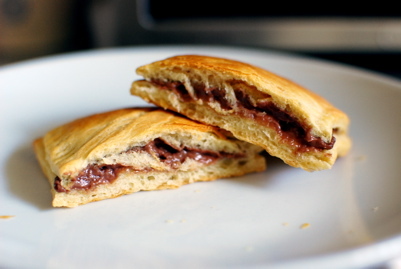 i spread the nutella on pretty generously. 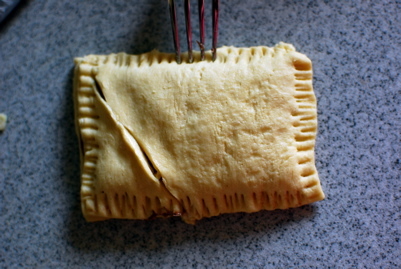 then i topped it with another piece of dough and crimped the edges shut with my fork. 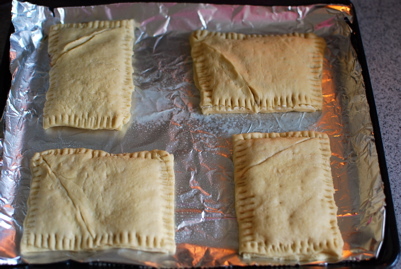 i ended up with four pastries, which was perfect since it was just the bean and me at home. yes, that totally meant i was allotting two apiece. we were hungry. after about ten minutes, my experiment was going slightly awry. 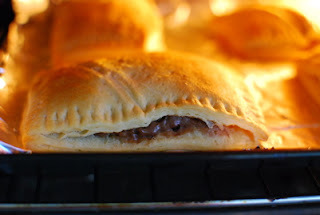 the good stuff was oozing right out of the sides and the whole thing was puffing up way more than i wanted. 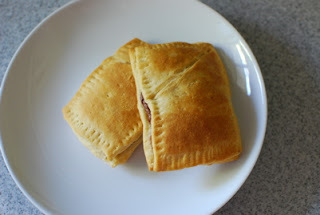 but if you weren't trying to recreate pop tarts, these were actually pretty good - soft, golden brown, warm, and full of gooey nutella goodness. how can that be bad? apparently it wasn't, judging from the bean's very positive review. "mommy, these are so delicious! you're the best cooking mommy in the whole world." I agree with your child. you also need to do this with that dang Biscoff spread!